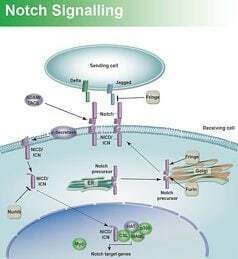 Notch is a transmembrane receptor that co-ordinates an important signaling cascade in all species. Notch signaling mediates local cell-to-cell communications as its ligands are mostly other transmembrane proteins, limiting the signaling to its neighboring cells. The main function of Notch signaling is regulation of cell fate specification, proliferation and death, for neuronal, cardiac and endocrine systems, and most particularly in stem cells. This determines the biological orientation of cells throughout development, allocating different cell types within a tissue. Notch signaling is widely accepted as being involved in the development of most tissues in most species. The pathway of Notch is seemingly very simple, however there are numerous complex regulatory mechanisms that are also associated. Ligands bind at Notch inducing its activation and cleavage. The truncated version of Notch is then targeted by γ-secretase, releasing an intracellular domain which translocates to the nucleus where it regulates gene expression and is a co-factor for numerous transcription factors. A variety of post-translational processes regulate Notch activity throughout its synthesis and secretion, its activation and trafficking, and its degradation. These post-translational regulations enable Notch signaling to have such versatility in many tissues. Aberrant Notch signaling is associated with numerous diseases, especially in cancer, neurodegenerative disease and cognitive defects.